There will always be somewhere new to explore. It's our human condition to seek the next frontier. With virtually our entire planet now accounted for, the next frontier just so happens to be the next planet over. In MJ Kaufman's How to Live on Earth, the not too distant future is explored where a group of humans will be sent to Mars to colonize without any prospect of coming home. How to Live on Earth is a fascinating character study that examines hope, fear, and everything in between with a backdrop of the space unknown. 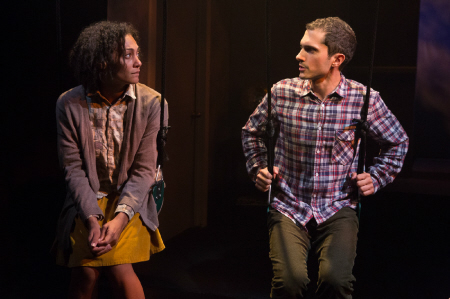 Through a series of intertwining stories, How to Live on Earth tells the story of Aggie, Bill, Eleanor, and Omar, and their hope of leaving behind earth for a new heroic adventure. We watch as they each battle the consequences of leaving and how it not only alters them but those around them. With some wonderful themes to explore on both a personal and universal level including escape, adventure, and the unknown, Kaufman truly highlights the importance of character. But the gravity of importance of singular characters was lost through the double casting. With many company members playing multiple characters, the significance of the primary four diminished. By keeping each actor an individual character, it would truly capture the importance of each relationship. There were a few moments that until you heard their name referenced or their scene partner appeared, it was difficult to figure out who was who. 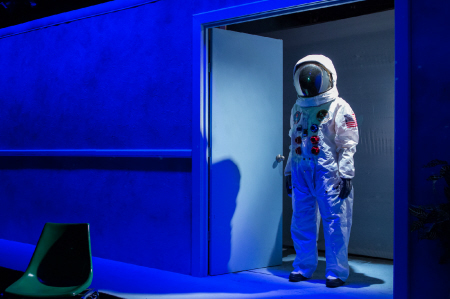 How to Live on Earth is truly an ensemble driven play. The way Kaufman structured the script was quite interesting. The narrative at the start focused equally on the quartet but once they result if their inclusion on the mission is revealed, their arcs seemed to be given different weights, especially Omar and Robert. Kaufman gives great importance to their story by giving them the final moment and line. But it had been scenes since we last saw them and the audience didn't know that that blackout was the finality of the play. Another glance at the overall structure could work to Kaufman's advantage. Additionally, the timeline of slave travel was a bit rushed and forced into the storytelling. The ensemble tapped into their characters to make great discoveries. Charles Socarides was great in his dual roles as Bill and Russ. Socarides found a way to make his characters vastly interesting. While one was a slacker poet and the other was an over-confident doctor, Socarides eased into each role, making you wonder at first if it was a different actor. Amelia Workman as Eleanor was grounded and poised. The bond between Workman’s Eleanor and Socardies’ Russ was possibly the most dynamic bond on stage. Playing Robert and Rick, Adam Harrington didn’t quite find a difference in the roles. It wasn’t until late in the show before you could truly tell that he wasn’t both Aggie’s father and Omar’s boyfriend. As Aggie, Molly Carden was living on her own planet. Though her character was one who longs for escape from the life and people around her, as an actor, she didn’t quite seem to connect with her scene partners. Director Adrienne Campbell-Holt brought a very cohesive vision to the stage. Campbell-Holt lifted Kaufman’s concept with ease through a dynamic and invigorating manner. Campbell-Holt highlighted the relationships of characters by keeping things simple. In the grand scheme of design, Amy Rubin’s set was impressive and great but Campbell-Holt kept the scenes tight utilizing the personal lens against the global picture. Rubin’s design transformed the HERE Arts Center Mainstage. Rubin capitalized on the interesting diagonal of the horizontal room. The scenic elements had a retro inspired feel that called back upon a time the heyday of the first space exploration. One of the most dynamic elements of Rubin’s set was the scenic shift that occurred when the mission to Mars officially took off. The walls began to disappear to showcase a scrim with a space projection by Lianne Arnold and occasional lighting tricks by Grant Yeager. With this stunning visual, you have to wonder was it worth not having it prior? Regardless, Yeager offered a variety of lighting looks that were captivating and motivating. Paired with the lovely soundscape by M.L. Dogg, the overall design of How to Live on Earth was top notch. How to Live on Earth is a wonderful concept on paper. The thesis that MJ Kaufman offers is enough to draw you in. But there were some bold choices that were mystifying, altering the big picture of the show. The relationships are present. It’s the storytelling that could be adjusted.